We accidentally went to one of the best restaurants in New York City. Who knew? We shopped the racks on 5th Ave and the East Side despite the windy damp weather that besieged us as we boutiqued our way through Manhattan. While escalating through Barney’s, we stopped to admire a Westie. The animal’s owner, a tragically hip young man, both intelligent and engaging spent time with us ‘hillbilly tourists’ (anyone not from New York) and shared his vast knowledge of the City. Over a period of about 25 minutes, we played with the pup, and discussed the best areas to live (Battery Park City and Astoria Queens) plus a myriad of big apple related subjects. 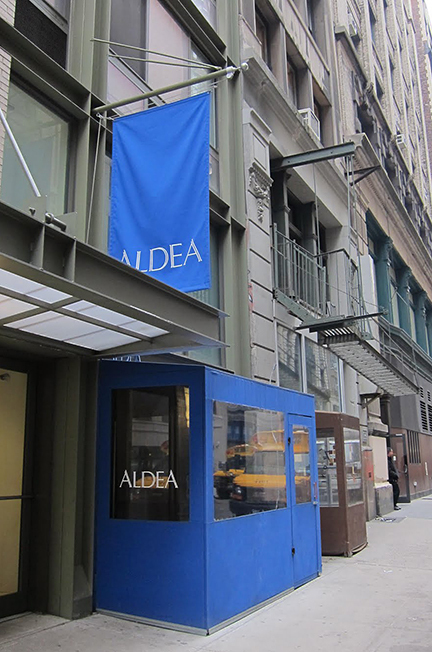 At one point in the discussion, he dropped the name, ‘Aldea’ and labeled it as a trendy eatery in Manhattan’s Flatiron neighborhood. Later, while looking for a place to dine, we recalled the recommendation and made a reservation and grabbed the last slot available—9:30 PM. It wasn’t until a month later, when I received a review copy of Chef George Mendes’ memoir and cookbook, ‘My Portugal’ that a bolt of understanding hit me and I realized why Aldea (village in Spanish) was one of the highlights of our Thanksgiving trip. 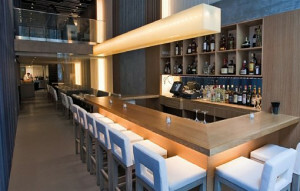 The place had garnered Michelin stars for four straight years and numerous other major awards and accolades. It was a cold bleak windy night when we fled our cab and found refuge inside Aldea’s windbreaker vestibule. The entry opened up into a railroad layout, long and skinny with double high ceilings. Supposedly inspired by the beauty of the Iberian coast invoking images of water, air, wind, clouds, sky and earth, the restaurant imparts the serious austere countenance made of sharp honed wood panels, weighty horizontal concrete planes and sheets of standing rippled glass. The hostess announced a 20-minute table wait, so we plopped down at the sleek modern bar. Consort ordered us a pair of one of Aldea’s signature cocktails, the DeNada, made with rum, apricot liqueur, lemon and egg white. The drinks, prepared with a flourish by the establishment’s expert mixologist were complex and airy and showcased his talent—he knew the proper two-step technique to shake egg white cocktails without ice to create the smooth, frothy meringue, then add ice for a second chilling shake. One taste of the pert and perky concoction and we knew that the evening was off to a profound start. We were seated in a banquette two-top bookended by a pair of young Canadians with Portuguese ancestry and a party of four Long Islanders doing a night on the town. With assistance from our server, we settled on one snack, two appetizers and a shared entrée. The ‘bread steward’ came by with a tray of three kinds of house made breads. You know how picky we are about bread—it can break or make a meal. We sampled them all twice and they were wonderful. The only low point, as was alluded to by our Canadian neighbors, was an 86ed fig bread of some repute. 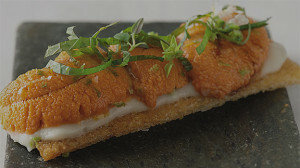 While we oohed and ahhed over the bread, our waiter plunked down our snack of sea urchin toast with cauliflower purée, mustard seed, shiso and lime. If the server hadn’t pulled her hand out of the way, she might have been injured in the frenzy that followed. The fresh uni punctuated with spice and citrus disappeared in 30 seconds—washed down with our first few sips of a glass of French rosé. Our apps arrived simultaneously, the wild mussel soup for me and the charred octopus for Consort. The savory soup served with perfect, plump sweet mussels, flecks of fennel, and chorizo all in a smooth coconut-curry sauce was quickly devoured by the two of us. The octopus, plated with a potato confit and a pool of squid ink puree spiked with lemon turned out to be the best version of the dish we had ever tried – tender octopus and charred crisp at the same time with deep and rich flavors. Halfway through our meal, we were disturbed by a row between management and the Long Islanders. It seems one of the woman guest’s hanger steak was too rare and her husband’s lamb was too tough. They wanted the items removed from the check despite the fact that they had left only a memory of the meals on their plates. The battle over, our entrée was served. The wild striped bass fogged our table in a warm, welcoming cloud of coconut broth aroma. The kitchen split the dish for us and it was a race to the finish that consort won. The verdict is outstanding—a silky broth, perfectly cooked filet of bass and excellent melange of root veggies. As members of the Clean Plate Club we had earned our pudding. In this case, it was a phenomenal cinnamon rice pudding papered with slices of apple cider gelée and sprinkled with a crunchy crumble of cinnamon toast peppered with bits of white chocolate. All in all, Aldea was a pretty sweet place to stumble into on a cold and stormy night.